Find out what's causing your red, watery eyes so you can get the right treatment. Even though they’re caused by different things, pink eye and allergies have some of the same symptoms, so it’s easy to confuse them. That’s because pink eye and allergies are both types of conjunctivitis, a term which just means inflammation of the conjunctiva. The conjunctiva is the outer membrane layer that covers your eyeball and the inside of your eyelids. So what’s the difference between pink eye and allergies? It comes down to the cause of that inflammation. The condition known commonly as “pink eye” is an infection, caused either by a bacteria or a virus. Allergies are triggered by various irritants, like pollen or pets. Pink eye (either bacterial or viral) and allergies, especially seasonal allergies, aren’t the only causes of eyes that look pink or red, but they’re among the most common. To really understand the difference between pink eye and allergy symptoms–and get the right treatment–it helps to know the different types of conjunctivitis. 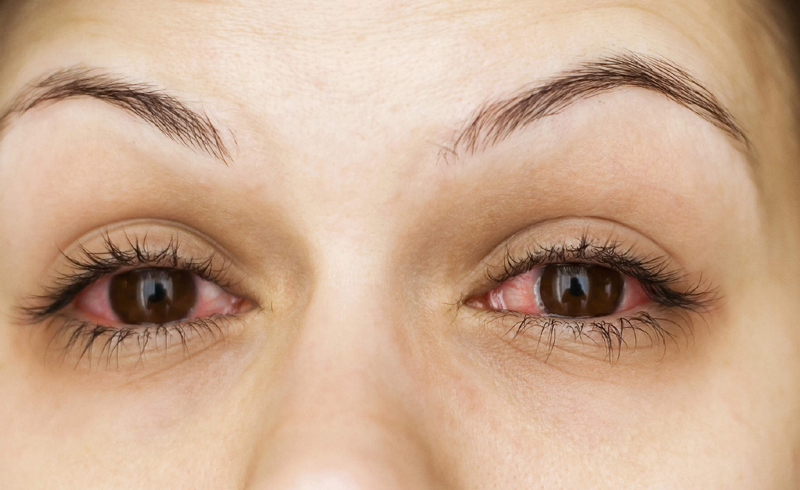 On top of red eyes and tearing, allergies can cause your eyes to itch and feel sore or burning. You may also have a gritty feeling in your eye, and it may swell. You might also have other classic signs of allergies, like sneezing or a runny nose. Doctors may notice other clues. “If we look under the eyelid we may find bumps indicative of allergies called papillae,” says Jules Winokur, MD, an ophthalmologist with Lenox Hill Hospital in New York City. Put all these symptoms together, and there’s a good chance you’re suffering from allergies. Allergic conjunctivitis isn’t contagious, and the symptoms can be treated relatively easily. Although regular over-the-counter allergy remedies may help, allergists recommend “focused treatment,” Dr. Winokur says, aka eye drops. If you can, try to stay away from whatever allergens are bothering you too. For more severe allergies, doctors may prescribe prescription medications, allergy shots, or steroids. If you wear contact lenses, take them out at the first sign of redness and irritation. In fact, you should do this whenever your eyes are irritated. “Wearing contact lenses puts you at a higher risk of infections,” says Dr. Winokur. The common name for both bacterial and viral conjunctivitis is pink eye. Bacterial pink eye is less common than viral pink eye and has symptoms that are different from both viral pink eye and allergies. You may have a crusty yellow or green discharge from your eyes, your eyelids can often be stuck together, and the redness is often only in one eye (though it can be in both). Itchy eyes aren’t usually part of the equation. For bacterial infections, doctors turn to antibiotic ointments or eye drops. “We can use a much higher concentration than you could get [from an oral antibiotic],” explains Dr. Winokur. This type of pink eye is contagious, so be diligent about washing your hands if you have it or are around someone who does. This is the most common form of pink eye, and it can be hard to stop it from spreading. “It’s highly contagious. You can get it just the same way you get a cold,” says Dr. Saini. That means not just from other people but also by touching surfaces infected people may have touched and then touching your eyes. Viral conjunctivitis also often goes along with a cold. “It’s usually related to a history of being sick or being with someone who is sick,” says Dr. Winokur. In addition to red eyes, you may have a discharge that is more watery than crusty. Viral pink eye usually goes away on its own after a week or two, but it can sometimes turn into bacterial pink eye. “When a person has viral pink eye [and] they keep rubbing their eyes, they could introduce bacteria,” says Dr. Saini. There’s no cure for viral pink eye, but there are ways to ease the discomfort. “It’s mostly supportive care like cool compresses and artificial tears,” says Dr. Winokur. Remember: You’re going to be contagious for as long as you have symptoms, Dr. Saini cautions. Make sure you wash your hands if you have pink eye or if you’ve been near people who have it. Since conjunctivitis simply means inflammation of the conjunctiva, it can also happen when you get something in your eye that irritates that membrane. “The symptoms are the same or similar to allergies: redness and teariness,” Dr. Saini says. The remedy for this type of conjunctivitis is very straightforward: Get the irritant out as quickly and as safely as possible. 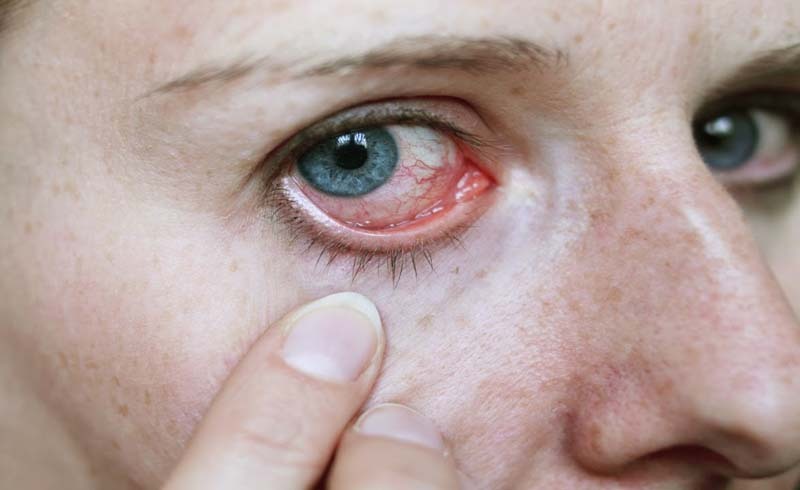 U.S. Daily News: Is It Pink Eye or Allergies?